Do the Vietnamese celebrate Western New Year or Christmas? Tet is the celebration of Vietnamese New Year, the country’s biggest holiday and their first day of the spring, based on the lunar calendar. The official name of Tet is Tết Nguyên Đán, which means “feast of the first morning of the first day”. Tet always falls around the end of January or start of February; This year (2019), Tet will fall on February 5th. The Vietnamese New Year is an exuberant, joyful time, full of life and color. It’s all about welcoming new things, making a fresh start, and wishing others happiness for the upcoming year. When you are travelling in Vietnam during this period, you will have the chance to witness this local celebration as a local. Being well informed about this national holiday is a way of showing your respect to the locals. They will appreciate your interest in their culture, and you will be well prepared to enjoy the best experience of Tet possible, so keep reading! Like any major holiday in Asia, Tet celebrations tend to disrupt everyday life, especially for tourists. If you’re travelling in Vietnam during Tet, keep these 6 things to be well prepared for this National Holiday. The days leading up to Tet are some of the busiest travel times of the year, as everyone goes home to visit family. Buses and trains get sold out, so make sure you get your tickets well in advance. We recommend booking your bus ticket one week in advance and train tickets even several weeks in advance during Tet! Also keep in mind that ticket prices often increase and can even double during the holidays. The worst days to travel are the two days before Tet and the three days following. Be sure to book your accommodation well in advance. We recommend booking several weeks beforehand as choices will be very limited if you book last-minute. When I travelled to Dalat without booking in advance, we had to pay $50 a night to sleep in the living room of a local family as everything was fully booked! The last day of the year, people will be occupied with the last preparations for the Tet Holiday. Doing the last shopping, cleaning the house and travelling to the home town. Don’t expect any buses to operate on the night of New Years Eve so be sure to arrive at least one day before. Sightseeing can become more difficult, as many museums and attractions are shut in the first few days of the holiday. A lot of restaurants shut down during Tet. If you have your heart set on experiencing Vietnam’s culinary delights, you might be disappointed. The only a few places that are open might only accept reservations and expect prices to increase with 50%-100%. Many shops close for a few days of Tet, but once they re-open, you might find some good bargains. Shopkeepers want to start the new year well, so they often reduce prices. Be aware that some consider haggling over prices to bring bad luck for the upcoming year. If you feel it’s absolutely necessary, then please do it in a polite way. Banks are closed during the holiday and ATMs won’t be refilled. This means you cannot get any cash when Tet is approaching. We recommend getting your cash out 2 days before Tet and make sure you can survive 4-5 days with this. Despite it being a difficult and more expensive time to travel, Tet allows you to experience the spirit of Vietnam at its best. Everyone is in a good mood, and people are even more polite than usual. There is a joyous, charged atmosphere, full of excitement, and it’ll be a cultural experience you’ll never forget. Hopefully all this joy and love from the people will counter-act your travel frustrations in case you didn’t prepare for this holiday. We have some good news for you! You already know more than most of the tourists after you read the tips above. This will save you from lots of frustrations, but keep reading, when you want to experience Tet to the fullest and learn why this national holiday is so important to Vietnamese. Why does Vietnam celebrate Lunar New Year? As China once had control of Vietnam, the Chinese instituted the lunar new year holiday centuries ago. This means Tet falls on the same day as Chinese New Year (although the one-hour time difference between Vietnam and China can cause the new moon to occur on a different day). Although the Chinese and Vietnamese celebrate their new year each with their own traditions, they still have some in common. Both the Vietnamese New Year and Chinese New Year have a zodiac (or wheel), rotating twelve different animals. Although the twelve animals are not all the same, this year February 5th will start the year of the Pig in both China as well as in Vietnam. Like most holidays, Vietnamese New Year is full of traditions. The main Tet celebrations last for three days, but the festive spirit carries on for about a week. As with other New Year celebrations, there are parades—bright, colorful processions with gongs, bells, firecrackers, and dancing—the more noise, the better, as it’s thought to ward off bad spirits. 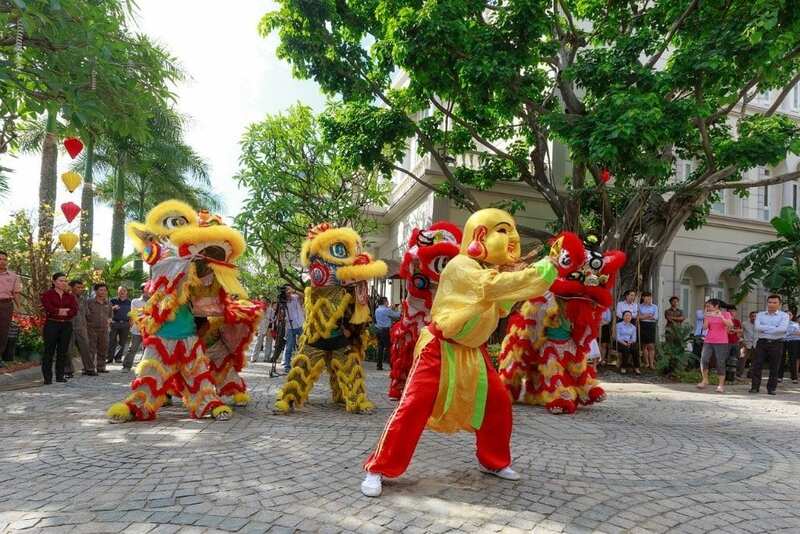 Many dancers wear masks, and one creature not to miss is the Mua Lan (Lion Dancers), a cross between a dragon and a lion, which represents a symbol of strength and power. Tet centers around visiting others. The first day is spent with family, with traditional foods and quality time together. On the second day many people visit friends, and the third day is set aside for teachers, who are highly respected in the culture. Temple visits and ancestral worship are popular, and families will pay respects at the family altar or visit ancestors’ graves. There is a big emphasis on luck and superstitions during this holiday. One Tet tradition involves cleaning the house beforehand, clearing away the old and making room for the new. Some people even paint their houses with a fresh coat of paint. No one sweeps during Tet, however, as people don’t want to sweep away good luck. Another popular tradition during Tet is the notion that the first person to enter a house on the day itself will decide the family’s fortune for that year, either good or bad. In order to make sure only good luck comes in, the head of the house or someone else deemed morally sound will leave a few minutes before midnight and re-enter just as the clock strikes twelve. Children join in the festivities, too. It’s customary for older family members to give “lucky money” to children in red envelopes, and in turn the children give traditional Tet greetings. Since Tet is all about a fresh start, many people like to pay off their debts before the New Year arrives. Much of Tet’s vibrancy and color come from the flower and plant decorations, which are a very important part of the holiday. Red and yellow are especially prevalent and are thought to bring good luck. 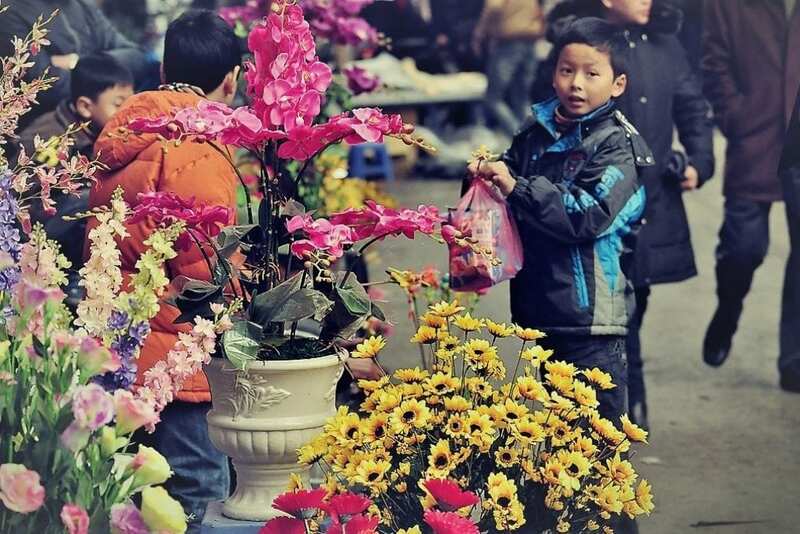 Flower markets burst into life, popping up all over the cities in the days leading up to the New Year. In southern Vietnam, yellow chrysanthemums or apricot blossoms take center stage, and peach blossoms fill the streets in the North of Vietnam. Another popular Tet decoration is the kumquat tree. You won’t get very far without spotting them as they are sold on every market. The plants and trees are also linked to luck: the more blooms on a branch or tree, the more good fortune for the family. Families place the trees in their living rooms, and its fruit-laden branches represent prosperity and fruitfulness for the coming year. The best places to celebrate Tet depends on what kind of experience you’re looking for. If you’d like to get the full of experience of Tet and aren’t put off by the crowds, places like Dalat, Phú Quốc, and Nha Trang are popular choices for the locals. In 2018, Dalat welcomed over 280,000 visitors during the celebrations. If you want to visiting these popular destinations during your holiday, again make sure you book any travel and lodging far in advance, and be prepared to pay more. The busiest times are the three days between the 3rd and 5th day of the New Year. This is when people have finished visiting family and want to enjoy the rest of the holiday in a beautiful place. Instead, we recommend to celebrate Tet in Hoi An or one of the bigger cities like Hanoi or Ho Chi Minh City. 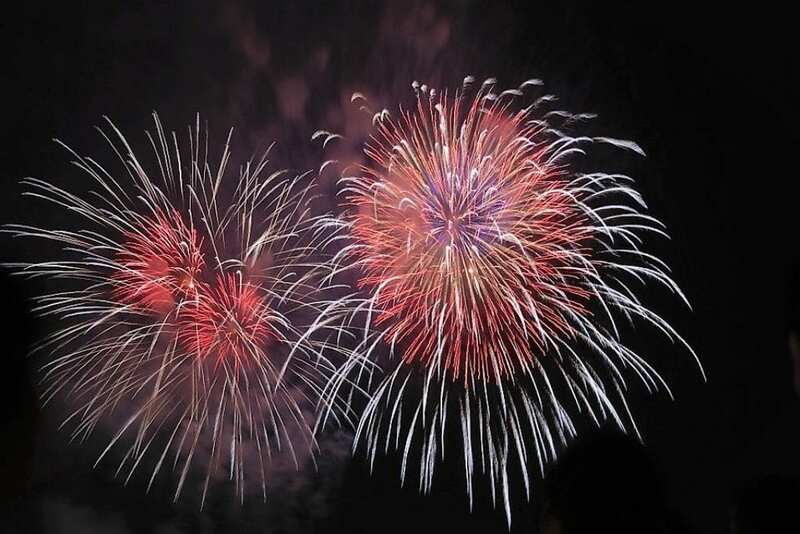 In these cities, you can experience the fireworks and parades on New Year’s Eve. However, keep in mind that many things in Ho Chi Minh and Hanoi shut down, and streets will be empty in the days following Tet, as everyone then goes home to visit family. Hoi An is a popular place to enjoy the celebrations, as many shops and restaurants stay open during the holiday. The Old Quarter is the place to be; it has an energetic atmosphere, with lively festivities and street-food vendors along the lantern-lit paths. When I was travelling in Vietnam during Tet, we witnessed a spectacular celebration in Hoi An. As the night wore on, the Old Quarter got more and more crowded (even more than usual), and all the locals were coming to the festival next to the lake. People dressed in animal costumes were moving around the podia to the beat of the drums. The big Lion, representing the symbol of strength, moved through the crowds, and at 12:00 there was a countdown. It was a very enjoyable experience and a great show to watch. Pro tip: Arrive in Hoi An a few days before to explore this vibrant city and do some shopping. On the day of NY’s eve, visit the Old Quarter in the evening and mingle with the locals to enjoy the festivities besides the lake. See this page to find the best way to travel to Hoi An. As Hanoi is Vietnam’s capital, it offers visitors a wide range of things to do. You won’t be able to go to places like monuments or museums once Tet starts, but you can join in the New Year celebrations, particularly by the Hoan Kiem Lake. Not everything closes down; shopping malls generally stay open, most hotels will still be open, and you’ll also find some restaurants that keep serving food. Pro tip: Experience Hanoi’s markets and bigger attractions several days before Tet, and then celebrate the New Year festivities. See this page to find the best way to travel to Hanoi. If you’re looking for a nightlife experience during Tet, HCMC will be right up your alley. On Lunar New Year’s Eve, bars will be packed and fireworks will light up the streets. 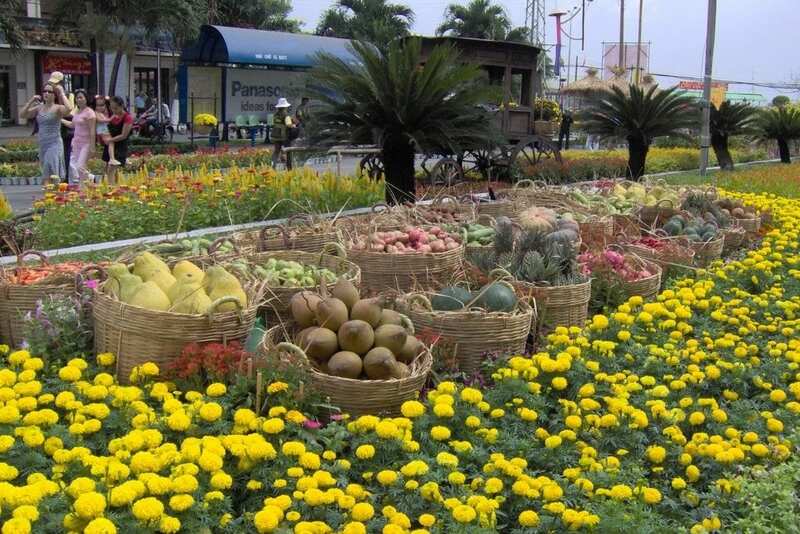 Check out the two festivals popular with locals: the Tao Ban Flower Festival and the Nguyen Hue Flower Festival. Besides the gorgeous red and yellow flowers everywhere, you’ll enjoy incredible food, folk music and games. 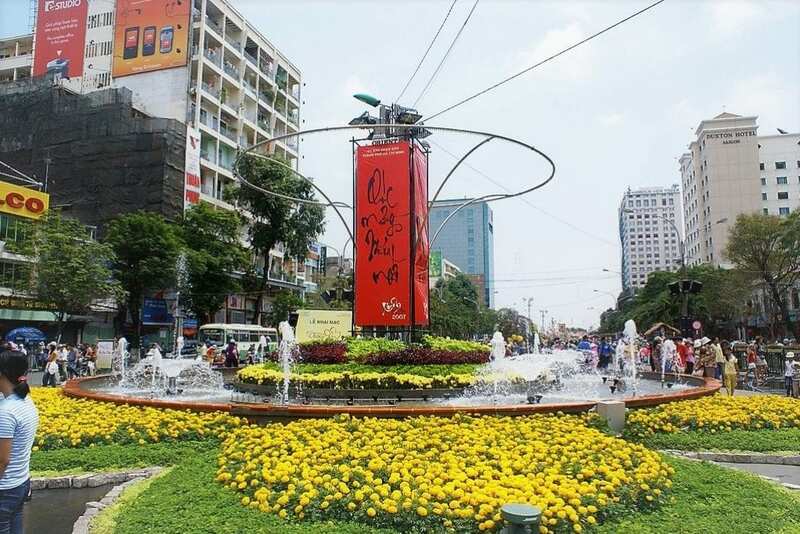 See this page to find the best way to travel to Ho Chi Minh. When you wake up on New Year’s morning, greet your guesthouse host with the traditional Tet greetings of “Happy New Year” (Chúc Mừng Năm Mới) or a more specific “gracious wishes of the new spring” (Cung Chúc Tân Xuân). It wouldn’t be Asia if it wasn’t about food. The Vietnamese phrase “to celebrate Tet” literally means “to eat Tet”, which indicates how important food is during the holiday. Preparations can take days in advance, and since most stores are closed when the holiday begins, the days leading up to the New Year are busy shopping times. Sticky rice plays a big part in the meal. Two traditional dishes are bánh chưng and bánh tét, consisting of sticky rice with meat or bean fillings wrapped in dong or banana leaves, and then boiled overnight. They’re shaped into squares (bánh chưng) to symbolise the Earth or cylinders (bánh tét) to represent the Moon. Candied nuts and seeds, pickled vegetables, and meats stewed in coconut milk are other common dishes found on Vietnamese New Year’s tables. Every family will have their own versions of these staple dishes. Popular snacks are roasted watermelon seeds, candied fruit, coconut candy and peanut brittle. Tet is clearly the biggest celebration for the New Year, but in recent years, the larger cities like Hanoi and Ho Chi Minh have been making efforts to put on a good show for the Gregorian New Year on the 31st of December, too. The fireworks won’t be as extravagant as they are in Sydney or London, but along with the concerts, parades and the parties, these Vietnamese cities do also celebrate December 31st along with other countries. As for Christmas, who doesn’t love a chance to celebrate? The Vietnamese get into the Christmas spirit with decorations, carols and sales, even though the day itself is not a public holiday, as Vietnam is mainly a Buddhist country. Christmas Eve is more of a celebration, with parties, food and fun. The Christians in Vietnam might attend a Midnight Mass and then enjoy a family dinner afterwards. In large cities like Hanoi and Ho Chi Minh, many people gather in front of the cathedrals, and children put their shoes out for Santa to fill with treats. Although Western holidays are celebrated in some form, Tet remains the most important holiday. It’s a celebration rich in traditions, history and meaning. A way of putting the past behind and looking forward to the new. And welcoming good luck with open arms and wishing each other happiness for the future. The people of Vietnam celebrate the New Year with so much life, joy and color that it’s easy to see why this holiday has captured the hearts of the entire nation. Have you been in Vietnam during Tet? Let us know in a comment below if it captured your heart, too!